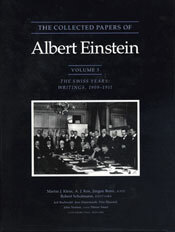 In October 1909 Einstein departed the Swiss Patent Office at Bern, which had been his professional home for seven years, and began his first academic appointment, at the University of Zurich. The volume concludes with the masterful report that Einstein, by then a full professor at the German-language University in Prague, gave to the original Solvay Congress, the first international meeting devoted to the problems of radiation and the quantum theory. Most of Einstein's efforts during these years went into his struggle with these ever more perplexing problems of quanta, on which he made discouragingly little progress. Einstein's new academic career naturally required him to teach, and almost half of this volume consists of the previously unpublished notes he wrote in preparation for his lectures on mechanics, on electricity and magnetism, and on kinetic theory and statistical mechanics. The last of these are particularly interesting in reflecting some of his research interests. Several papers here are concerned with aspects of the special theory of relativity, but it is Einstein's article of June 1911 that is a harbinger of things to come: it contains his calculation of the bending of light in a gravitational field on the basis of his equivalence principle.